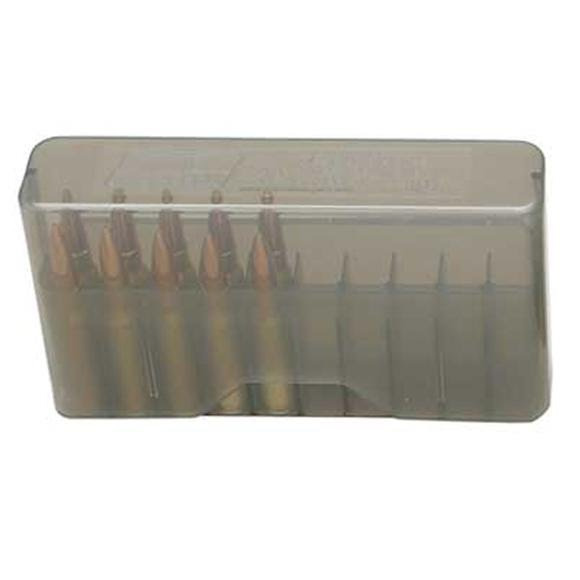 MTM Case-Gard J-20 series ammunition cases are a favorite of rifle enthusiasts throughout the world. Made of virtually indestructible polypropylene that will not warp, crack, chip, peel, expand or contract. The Case-Gard J-20's are available in five sizes. All rounds are listed bullet up position. Some reloaders don't like the lid touching there bullets, so the lid dimension below is for them. MTM Case-Gard J-20 series ammunition cases are a favorite of rifle enthusiasts throughout the world. Made of virtually indestructible polypropylene that will not warp, crack, chip, peel, expand or contract. The Case-Gard J-20&apos;s are available in five sizes. All rounds are listed bullet up position. Some reloaders don&apos;t like the lid touching there bullets, so the lid dimension below is for them. There are a lot of reloaders that expand the case as much as half inch and claim no problems with accuracy. 219 Zipper, 22 BR, 22 Cheetah, 22 PPC, 22 Sav. HP, 22 Rem Jet, 220 Rus., 250 / 300 / 303 Sav., 30 / 35 Rem., 30 Rem. AR, 32-40 / 375 / 38-55 Win., 401 Win. S.L., 445 Super Mag., 450 Bushmaster, 460 S&W Mag., 5.6x52 Rimmed, 6.8mm Rem. Spl., 6mm BR-DX, 6mm Norma BR, 6mm PPC USA, 7.62x39 Rus., 7mm BR. Lid is at 2.52" OAL.